This flights takes you from the Tribhuvan International Airport towards the east flying parallel to the Himalayan range & finally reaches to the point from where a spectacular view of the Everest can be seen. You shall be flying close to Mt. Langtang & Jugal Himal on your way back, finally ending up with an aerial view of the entire valley. From the TIA we land to Symbyochaya (EVEREST VIEW Hotel); it’s the base station of MT. 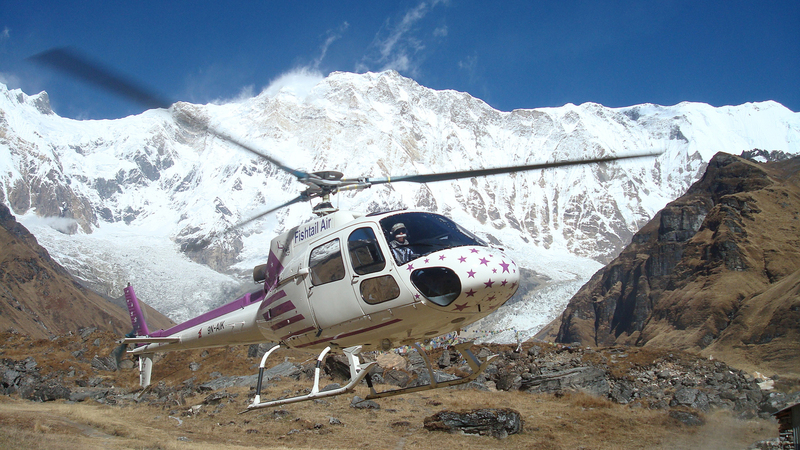 EVEREST, in the Hotel we land on the helipad for an hour as a ground time which charges will be from our side (ground time will be free of cost for an hour; if the clients demand more than an hour halt then that case will be charge $ 200/- per hour. And from there we will take off up in the Himalayas. The clients will be enjoying the views of Himalayas ; our space between the Himalayas will be just 100 ft. above the cliff; its somewhat like eventually touching the Himalayas . After the aerial viewing of the Himalayas ; will get back to Lukla for refilling of fuel & technical check up for the returning back to Kathmandu @ TIA. Max.Altitude:5,644.5 m (18,519 ft) ft.